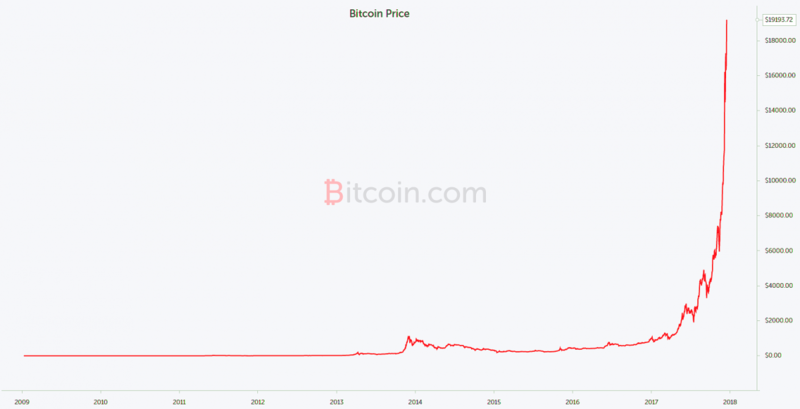 The following is a summary of our recent podcast, "Is Bitcoin a Modern-Day Tulip Mania? ", with cryptocurrency researcher Demelza Hays, which can be accessed on our site here or on iTunes here. On the day we are writing this, bitcoin traded to a high of $19,227.08. The price increase for 2017 has been so explosive that major media outlets are now providing regular price updates around the clock while profiling a new crop of bitcoin millionaries—some just teenagers—as families sell all their belongings to invest in the new currency that will change the world. For all these reasons and more, the naysayers love to compare what we see today to the Tulip mania of the 1600s, one of the first and most widely-cited bubbles in history. This time on FS Insider, we spoke with Demelza Hays on the bitcoin-tulip mania comparison and her newly published Crypto Research Report. During the Tulip mania, new sources of gold and silver from the New World came to Amsterdam, driving up the prices of goods and services. In addition to the increase in money, tulips, like bitcoin, were novel, exotic, and relatively limited in supply, eventually becoming so popular that a tulip futures market was even created, as we now see with bitcoin only days ago. While this comparison has some merit, especially when we look at the exponential price increase, tulips were not a technological breakthrough. Bitcoin, however, combines encryption and distributed computing to create an immutable chain of verified transactions (the “blockchain”) to solve a long-standing problem that made decentralized, digital payments previously impossible. Basically, Satoshi Nakamoto and the group of people who created Bitcoin were able to make a permanent ledger of information by solving the “double spend problem,” which describes a situation where someone wants to send sensitive information over a network, but any of that information can easily be duplicated. While Bitcoin has led the way, newer technologies are being developed based on the blockchain. Demelza, who also teaches a cryptocurrency course at the University of Liechtenstein, classifies them into three different groups. In the first category, we have medium-of-exchange cryptocurrencies like Bitcoin, Bitcoin Cash, Monero, Litecoin, Dash, and others. The second category consists of infrastructure cryptocurrencies like Ethereum, Ethereum Classic, Iota, Tazos, and others. These allow users to build smart contracts and other cryptocurrencies on top of the blockchain technology. Demelza refers to the third category as general purpose tokens, which do not have utility themselves but serve as a digital share in a company, which are allowed to be traded on cryptocurrency exchanges. Current computing technology used to mine bitcoin is specialized and limited, but one day that may change. Right now, blockchain technology is largely limited to mining cryptocurrencies, but has the potential to unleash a whole new world of global computing. Because of its decentralized, global scale, however, bitcoin “is using an enormous amount of electricity,” Hays told listeners. That being said, our current banking and financial system uses far more, she added. Bitcoin’s power consumption is starting to gain more and more attention, not just in terms of skyrocketing transaction fees, but also when it comes to concerns over the size of bitcoin’s carbon footprint. Ultimately, this may be the reason sentiment finally turns negative on this new technology; or, if you are into the more conspiratorial side of things, the means by which “the powers that be” try to take it down. For more about Hays’ investment guidelines and thoughts when it comes to cryptocurrencies, listen to the podcast by logging in and clicking here. To read her recent Crypto Research Report, click here. Subscribe to FS Insider and listen to all our daily interviews with leading guest experts by clicking here.